Constructed over two centuries ago, the Jakkur Lake of northern Bangalore is located in Jakkur, also called Jakkuru village. Spread across 160 acres, it is one of the few lakes alive and thriving in the north-eastern outskirts of Bangalore. Located quietly away from the hustle bustle of Hebbal highway, towards the Devanahalli International Airport, the Jakkur Lake in Bangalore, is a pristine and calm spot amidst the busy city. The lake and its environment are home to a number of species of birds and marine life. Often one can spot a group of waterbirds swimming idly, or a spot-billed pelican taking off at the lake. It is almost impossible to believe such a naturally beautiful world coexists with the man-made, urban world. But of course, utmost care needs to be taken to preserve and grow it. Jakkur is well known for the Jakkur Aerodrome - the only dedicated general aviation field in the Bangalore city. The Jakkur Aerodrome and its vicinity are frequented by enthusiasts as it is the grounds for events and activities like parasailing, hot-air balloon rides, microlight flying and other aerosports. 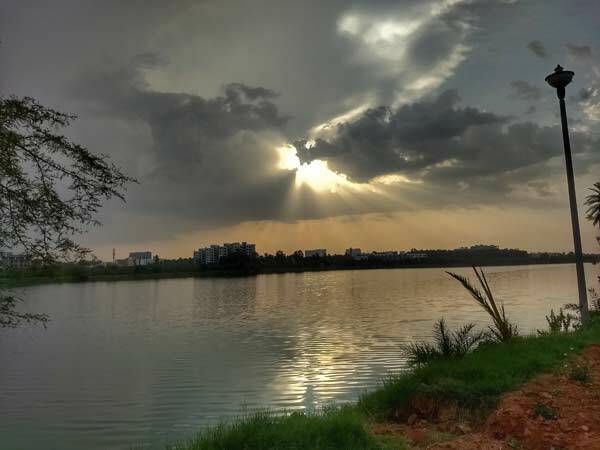 Jakkur Lake is located between Hebbal and Yelahanka, on the eastern side of the NH 44 and can be easily reached by driving towards Hebbal or Jakkur on the Outer Ring Road. If you wish to travel by public transport, you can board a number of city buses plying towards the Outer Ring Road, Hebbal, Jakkur or the airport. Or you can opt for autorickshaws and cabs. Self-drive is, of course, the best and hassle-free way to reach the Jakkur Lake. It is about 10 km from Hebbal, 3 km from Jakkur Aerodrome and less than a kilometre from Jakkur Post Office. There isn't much to do at Jakkur Lake per se. It is one of those quiet places where you'd like to go once in a while to relax and rejuvenate. Occasionally, certain clubs organise photography or birdwatching workshops which are open for all. A picnic or a half-day outing can be planned with friends and family. You could also club it with a visit to the Jakkur Aerodrome. If you are a nature & wildlife enthusiast, pack a day bag, grab a pair of binoculars and head to the Jakkur Lake early in the morning. You will see a number of birds flocking at the lake and on the trees around it. The lake also has plenty of fish, and you can spot many aquatic birds including ducks, geese, pelicans, storks, etc. Jakkur Lake is an ideal place to practise wildlife and nature photography. The sunrise and sunset will get you some great shots. It is a pretty uncrowded place, save a few visitors or joggers, so you can practise your art peacefully without any disturbance. If you are an early bird, you could drive to the lake at the crack of the dawn and enjoy the lovely sunrise by the lake. Enjoy the day exploring the lake and its surroundings, indulge in the aerosports at Jakkur Aerodrome and maybe watch the sunset before you call it a day. There are a number of other lakes around the area. If you are interested, you could go lake-hopping and visit the nearby Hebbal Lake, Nagavara Lake, Rachenahalli Lake and Puttenahalli Yelahanka Lake. As many as 7000 birds are known to have been sighted at the Puttenahalli Yelahanka Lake during the breeding season and it has been home to some of the rare and endangered species of birds from northern Himalayas and Siberia.